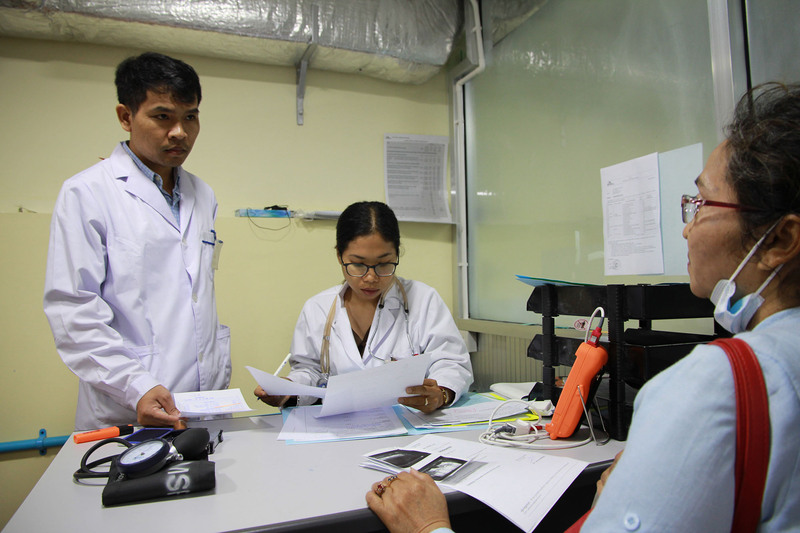 American medical doctor Theresa Chan is in Cambodia, based in MSF's hepatitis clinic in Phnom Penh. Here she blogs about a patient suffering the devastating consequences of hepatitis C, catalysed by lack of access to care in the country. Midway through my first week in the hepatitis C clinic, a patient was urgently triaged for an MD evaluation. He arrived on foot, but only with the support of his son and his daughter. There was an unfocused quality to his gaze and the whites of his eyes were yellow. “How long has he been sick?” I asked his daughter, because he couldn’t answer me himself. He just blinked at me and nodded, with his eyes averted as if he were listening intently to his own, opaque thoughts. It took both of his children and a bit of help from me to get him onto the exam table. His abdomen was the size of a 36-week pregnancy and felt dull and tight to my touch. He’d been diagnosed with hepatitis C and clearly he had cirrhosis - chronic scarring of the liver. His daughter told me he sometimes vomited blood-tinged fluid, a worrying symptom of gastrointestinal (GI) bleeding from esophageal varices, which are veins abnormally dilated due to pressure exerted by the scarred liver. I thought about sending him home with medicines to improve his symptoms, but he could barely walk, and when his son told me they lived in a province five hours from Phnom Penh, I decided he was too ill to travel, so I arranged to have him admitted to the Gastrointestinal Disease (GI) Ward. Two days later I went to visit him in the hospital. He was sitting up, eating rice and making good eye contact with me. He even smiled. His abdomen was still that of a third-trimester pregnancy, but it didn’t feel as tight. The doctors on the GI Ward had drained some of the fluid which had accumulated there as a consequence of cirrhosis, a condition called ascites. He was able to answer my questions, so it seemed that the encephalopathy - a state of temporary confusion, also due to cirrhosis - had improved as well. But the next week he was worse. His son told me he complained of abdominal pain and hadn’t slept all night. He looked through me with the same unfocused gaze as the first day I’d met him. The notes from his GI Ward doctors commented upon worsening kidney as well as liver failure. They were compelled to stop the diuretic medicines he was taking to control the ascites. Meanwhile, a liver ultrasound showed a large nodule which was suspicious for hepatocellular carcinoma (HCC), a dreaded complication of hepatitis C. Unfortunately, because of his kidney failure, he could not undergo CT scan of the abdomen for definitive diagnosis. He was entering the stage of illness I call the Rock and the Hard Place, when every attempt to improve his liver symptoms would worsen his kidney function. Furthermore, the likelihood that hepatitis C had caused liver cancer meant that he could not be treated with the direct-acting anti-viral (DAA) medicines he was hoping to receive at our clinic. It’s important to tell this man’s story, because it illustrates how much is at stake in the treatment of hepatitis C in Cambodia. Up to a third of hepatitis C patients will develop cirrhosis and one or more of its complications: ascites, GI bleeding, encephalopathy, jaundice, and hepatocellular carcinoma. All of these complications bring life-changing disability. Patients usually have to leave the workforce and their family members have to make sacrifices to take care of them. 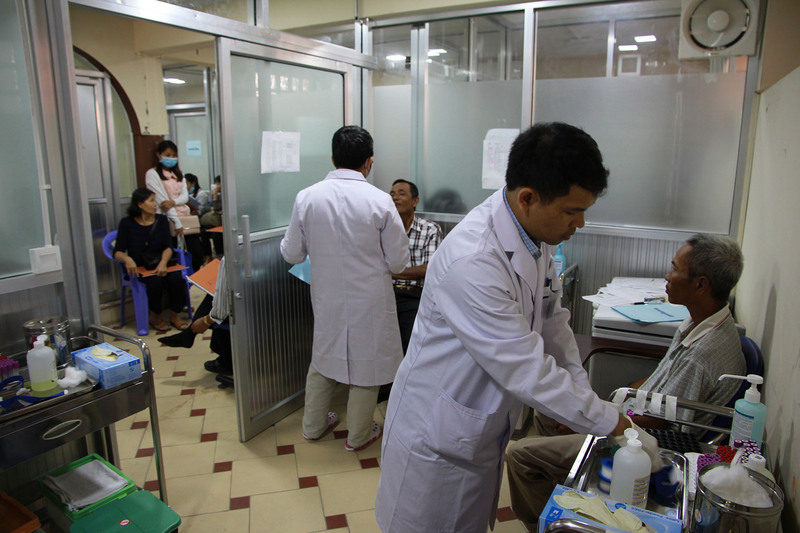 In Cambodia, where people pay out of pocket for health care and the gross domestic product per capita is only $1,158--putting advanced hepatic care out of reach for the vast majority of people--hepatitis C cirrhosis is too often a story of early death and unwitnessed private loss. Every person MSF treats with DAA medicines is one less person who will develop advanced cirrhosis. A few days later, my patient awoke and, in a rare lucid moment, told his family he wanted to go home. His doctors and I agreed that there was nothing more we could offer him, so his family made arrangements to drive him back to his home in the countryside to die. When I went to visit him before he left, his eyes tracked back and forth at nothing I could see, as if he were searching for a different end to his story.